The Hay Shed has 3 bedrooms and can accommodate 6, plus two fully-sprung double sofa-beds. All the rooms have stylish matching soft furnishings, the curtains are fully-lined and each room has hardwood, polished flooring. All windows are double glazed. The spacious lounge feels cosy with its low ceiling and exposed wooden beams. There are two large sofas and one smaller sofa (ideal for the children) with a Super Keshan pure wool rug in the centre. The matching solid dark wood table and cupboards are hand crafted from the Irish Coast Wood Company. They provide ample storage space for all your possessions. The Hay Shed may well be over 120 years old but this holiday home offers all the modern gadgets you will need to have a fun and relaxed holiday. There is a huge 50 Panasonic television with Freeview, a DVD player, Hi-fi and Wi-fi internet access throughout. The large Master Bedroom boasts a King Sized Sleigh designed bed. This is furnished with hollow fibre duvets and pillows that are totally safe and non-allergic. There are spot lights nestled in the ceiling with the original wooden beams. These provide soft lighting in addition to the dual lamps above the bed. Sun light sweeps in through the windows that line the full length of this room. There is a large wooden framed mirror on the wall and another sofa for your comfort. You are sure to have a peaceful nights sleep. 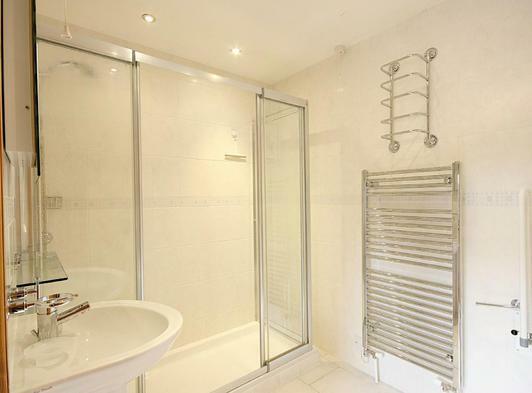 For an added taste of luxury all three bedrooms have their own spacious ensuite facilities, comprising of a shower unit or bath, toilet and heated towel rail. At the Hay Shed all the bedding is non-allergic (10.5 tog duvets mixed with polyester and cashmere). Towels are provided. The second bedroom, with ensuite facilities has a double bed and a large wardrobe with drawers  ample storage for all your clothes and shoes. This room is flooded with sunlight as the windows along the back wall run from floor to ceiling. The third bedroom, with en-suite facilities comprises of two single beds. These can be zipped together, if you wish to join them up securely. 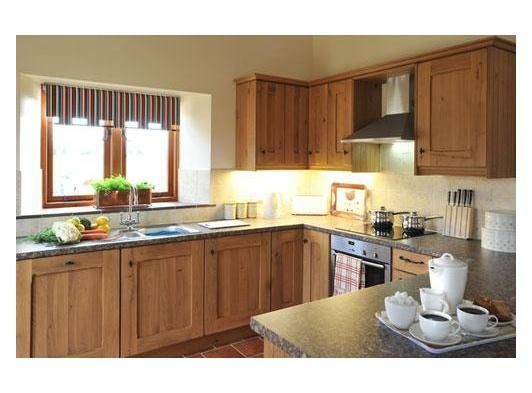 The large modern kitchen has solid oak kitchen units with plenty of cupboards for storage. The flooring is made of rustic, terracotta quarry tiles. There are first class kitchen appliances throughout including a family sized dishwasher, an Indesit fridge and freezer and a Neff oven. A washing machine (with a mains water softener) and tumble dryer are available. The kitchen is fully stocked with a large selection of cooking condiments and utensils from casserole dishes to an egg timer. Plus, theres everything you need for a picnic lunch, perhaps at the nearby popular National Trust property Sheringham Park. Upon arrival to the Hay Shed you will find a generous Welcome Pack which has everything you need for your first night. This pack includes fresh milk and bread, biscuits, tea, coffee, sugar, butter, preserves fruit cordial, a bottle of wine and a copy of our local newspaper the Eastern Daily Press. The Dining Room is a conservatory with a splendid dining table to seat 8 but can easily be extended to seat 10 comfortably. Patio doors lead to a large outside courtyard. This magnificent room is filled with sunlight so you can savour the stunning, tall Norfolk skies whilst enjoying your meal together  a superb room, ideal for entertaining the entire family in style. Two outside areas  The Hay Shed has two outside areas for you to enjoy. 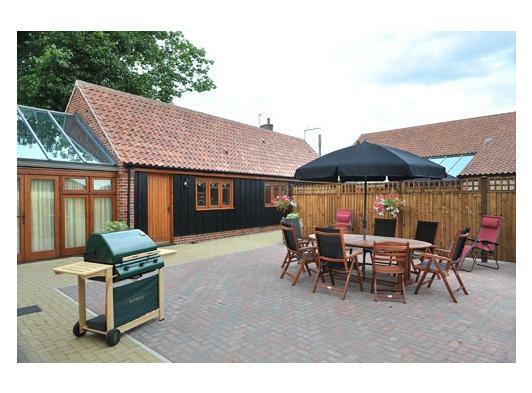 Firstly, in the centre of the property is a small, Norfolk Stone walled courtyard  ideal for sharing a bottle of wine after a busy day having fun with the children. 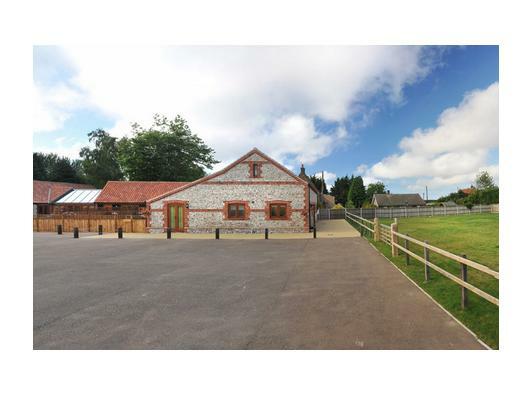 The second outside area is a large paddock which is shared with the second barn. This is a large grassed area for the children to run around, play and have lots of fun. This lawn space has a patio with a table, chairs and parasol, a BBQ and garden games. There is ample parking for up to 8 cars on the driveway at the front of the barn. The Malting House and The Hay Shed together can successfully accommodate two large families or groups. The close proximity of these two properties make it an ideal location for a larger, extended family to enjoy their holiday together or two groups can holiday together. 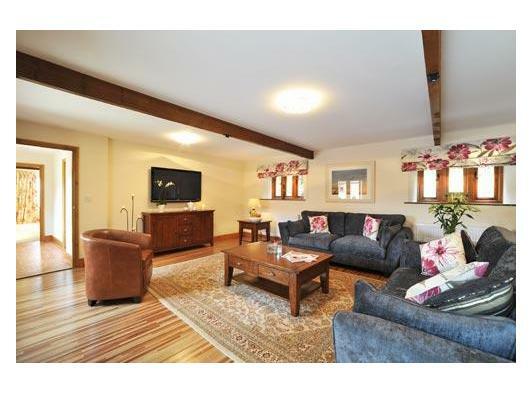 The Malting House has 3 bedrooms and can accommodate 6 plus 1 double fully sprung sofa. All the rooms have stylish matching soft furnishings, the curtains are fully-lined and each room has hardwood, polished flooring. All the windows are double glazed. The Lounge The main living space in the Malting House Barn is a magnificent room with towering high ceilings and exposed wooden timbers. From the ceiling hang two impressive chandeliers with matching lighting throughout. There are two large sofas with a Super Keshan pure wool rug in the centre. The matching solid dark wood table and cupboards are hand crafted from the Irish Coast Wood Company. They provide ample storage space for all your possessions. The Malting House has a long history and we guarantee that this holiday home will exceed all your expectations. 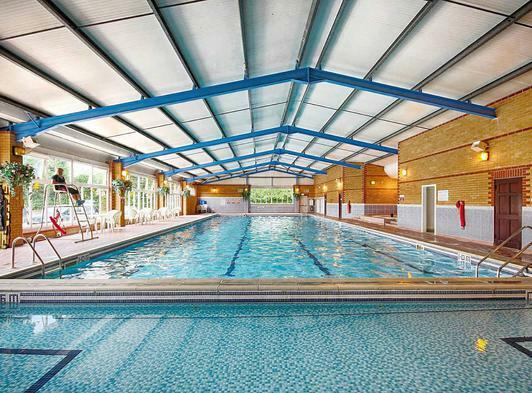 It provides modern facilities and all the latest gadgets you will need to have a fun and relaxed holiday. This includes a massive 50 Panasonic television with Freeview, a DVD player, Stereo and Wi-fi internet access throughout the barn. Despite The Malting House being over 100 years old, a modern and unique design has been carefully planned throughout. 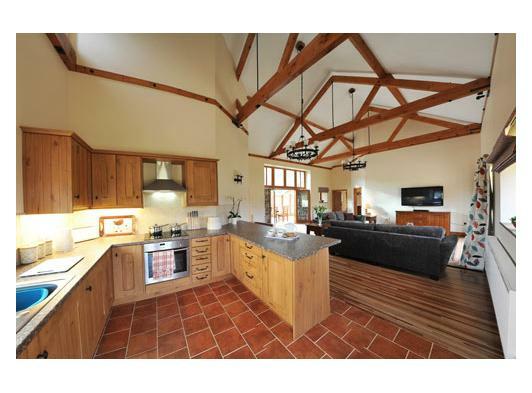 This has allowed for a combined, spacious open plan kitchen and lounge area, with patio doors leading outside to the large paddock. The huge area this room occupies adds to the sense of luxury. There is more than enough room for you and your loved ones to relax, unwind and have fun. 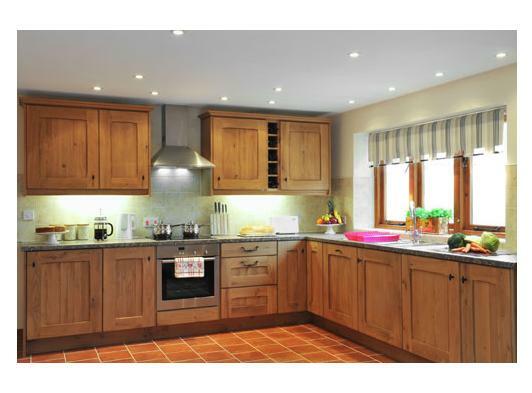 The modern kitchen has solid oak kitchen units with plenty of cupboards for storage. The flooring is made of terracotta quarry tiles. There are first class kitchen appliances throughout to include a family sized dishwasher, an Indesit fridge and freezer and a Neff oven. The kitchen is fully stocked with a large selection of cooking condiments and utensils from casserole dishes to an egg timer ! Plus theres everything you need for a picnic lunch perhaps at the nearby popular national Trust property Sheringham Park. The breakfast bar that splits the two rooms is a great place to start your days holiday here in beautiful North Norfolk. Welcome Pack  Upon arrival to the Malting House you will find a generous Welcome Pack. This has everything you will need for a comfortable first night. The pack includes fresh milk and bread, biscuits, tea, coffee, sugar, butter, preserves, fruit cordial, a bottle of wine and a copy of our local newspaper the Eastern Daily Press. 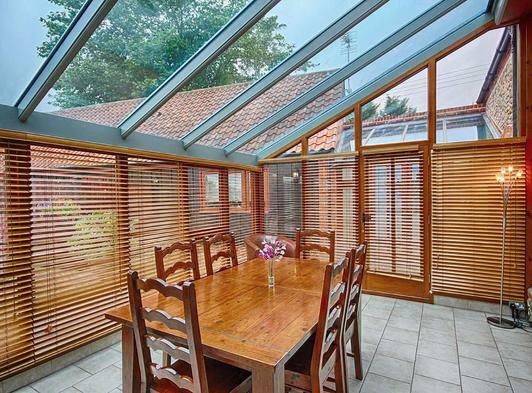 The Malting House boasts a beautiful conservatory for its dining room with a large, solid wood dining table. This has ample room to seat 8 but can easily be extended to seat 10 people  ideal for entertaining the entire family in comfort. The conservatory Dining Room has double patio doors leading to the courtyard outside. Throughout the day the room is filled with sunlight so you can savour the stunning, tall Norfolk skies whilst enjoying your meal together. The large Master Bedroom is a superb room which has a King Sized Sleigh designed bed. This is furnished with hollow fibre duvets and pillows that are totally safe and non-allergic. You can be sure of a peaceful nights sleep. The original wooden beams nestled in the gently sloped ceiling gives a hint of the original character of this unique building. Natural sunlight fills the room from the full-length, floor to ceiling double windows. For your comfort there are two lamps above the bed. There are beautifully co-ordinated soft furnishing plus a matching dark wood wardrobe and chest of draws to store all your clothes neatly. For a truly luxurious holiday every bedroom has its own spacious en-suite facilities comprising of a shower unit or bath toilet and heated towel rail. At the Malting House all the bedding is non-allergic (10.5 tog duvets mixed with polyester and cashmere). Towels are provided. Second Bedroom with en-suite facilities comprises of two single beds. These can be zipped together, if you wish to join them up securely. In the corner of this room is a fully-sprung sofa bed to comfortably sleep a further two people. This room is tastefully designed with co-ordinated soft furnishings. The two large windows look out directly to the large paddock at the back of the property. The third bedroom has a double bed, again with en-suite facilities. 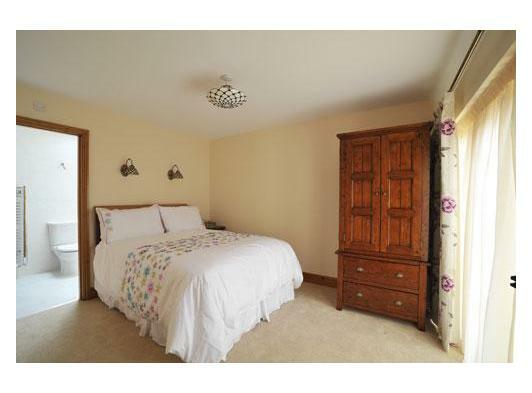 There are pretty, co-ordinated soft furnishings plus a dark wood chest of draws to store all your clothes tidily away. This property has its own separate utility room. It has everything you need including a washing machine (with a mains water softener) and tumble dryer. The Malting House has a large paddock which is shared with the second barn. This is a grassed area for the children to run around, play together and have fun. This lawn space has a patio with a table, chairs and parasol, a BBQ and garden games. We can take phone enquiries personally from 7:30am – 5:00pm Monday to Friday. Outside of these hours please leave a message on our answer machine and we will get back to you during office hours.